The 2012 presidential will be dirty… literally dirty, warned Prime Minister Vladimir Putin whose plans for 2012 are “an election and a shower”. A new hint that the Russian strongman will be seeking for presidency next March. Russian Prime Minister Vladimir Putin warned on Thursday that the March 2012 presidential election campaign would be dirty, but stopped short of saying whether he would seek another stint as Kremlin chief. Putin, Russia’s most popular politician, made clear he would play a significant role in the election but told supporters he would need to cleanse politics after the campaign. “I shall go to wash, in the hygienic sense of the word but also in the political sense,” Putin said, when asked at a regional conference of his ruling United Russia party what he would do the day after the March presidential election. “After all the campaigns which we shall have to endure, you have to be properly hygienic. Unfortunately, this is an inevitable process,” he said. “As Churchill said: Democracy is the worst form of government but there is no better one,” Putin said in the Urals city of Yekaterinburg. Putin and his protege, President Dmitry Medvedev, have both repeatedly refused to say which of them will run in the March 2012 presidential election, which follows a parliamentary election in December. Russian President Dmitry Medvedev’s trust and approval ratings have somewhat gone down and Prime Minister Vladimir Putin’s remained at the previous level in the past month, according to a poll of 1,600 respondents the Levada Center sociological service conducted in 130 populated areas of 45 regions of Russia on June 23-27.Medvedev’s trust rating has declined by five percentage points and the approval rating by three percentage points, with 33% of those polled trusting the president and 66% approving of his work. Putin’s trust and approval ratings remained at 41% and 69% respectively. Emergency Situations Minister Sergei Shoigu’s trust rating has declined to 11%, putting him in this respect behind Liberal Democratic Party leader Vladimir Zhirinovsky and Communist Party leader Gennady Zyuganov (12% each). The top ten most-trusted policymakers in Russia also include Patriarch Kirill of Moscow and All Russia (7%), Foreign Minister Sergei Lavrov, Health and Social Development Minister Tatyana Golikova, Moscow Mayor Sergei Sobyanin, and A Just Russia party leader Sergei Mironov (5% each). The poll also showed that only 46% of Russians approve of the government’s work. The number of respondents believing that the things are going in the right direction on the whole has declined to 41% from 44% in the past month. Just as a month ago, 27% of Russians believe in the government’s ability to improve the state of affairs in the country, 37% do not believe in this, and 33% are undecided. Was it a safe choice for russian billionaire Mikhail Prokhorov to enter politics? The giant womanizer is being sued by a Siberian region for tens of millions of dollars in allegedly unpaid taxes, just after he announced he was entering politics, reports said on Saturday. The Lenosibirsk district of the Krasnoyarsk region of central Siberia is seeking two billion rubles (70 million dollars) from billionaire Mikhail Prokhorov, the RIA Novosti news agency and Kommersant daily reported. The move comes just a month after Prokhorov, head of the Onexim investment holding with a reported fortune of $18 billion, unexpectedly announced he was going into politics and planned to lead the Right Cause Party. Prokhorov is registered in the tiny Siberian village of Eruda and pays his taxes there. The local branch of the tax service believes Prokhorov failed to pay taxes due to the Russian state on a transaction in Britain — in south Wales — in 2008, the deputy head of the regional anti-monopoly service Oleg Kharchenko was quoted by RIA Novosti as saying. “As the Lenosibirsk tax inspectorate lacks an experienced specialist in the problems of south Welsh tax law, they asked the anti-monopoly service for help,” he was quoted as saying. A source in the regional tax inspectorate told RIA Novosti that the issue had already gone to court. 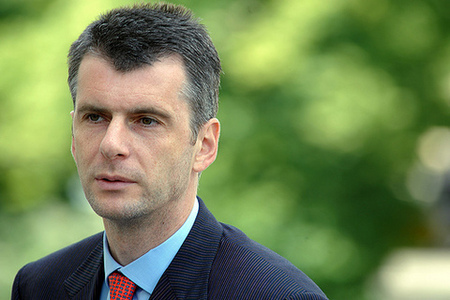 Prokhorov was quoted on the sidelines of the Saint Petersburg Economic Forum as acknowledging the dispute but expressing confidence that he would win in court. The entry of Prokhorov into politics sent a ripple of excitement through Russia’s political scene, though cynics pointed out that neither the billionaire nor his party have so far sharply criticised the Kremlin. Russia’s former richest man Mikhail Khodorkovsky was arrested in 2003 on suspicion of tax evasion, at a time when he was financing opposition parties. He was convicted twice and is not due for release until 2016. Politics: what is Prokhorov’s game plan? Is Mikhail Prokhorov defying Vladim Putin’s authority by entering politics? Since Khodorkovsky’s indictment something was clear in Russia: oligarchs make business and Putin makes politics… A new deal in Russian balance of powers? Mr Prokhorov wants to lead the Pravoye Dyelo party, or Right Cause. He owns much of Russia’s gold and nickel production, with other interests as diverse as nanotechnology, a hybrid car and the New Jersey Nets basketball club. The last oligarch to turn politician, Mikhail Khodorkovksy, ended up in prison. Mr Prokhorov made his money in the chaotic years of Russian privatisation during the 1990s. His fortune is reportedly worth $22.7bn (£14bn), which puts him among the top three Russian billionaires. Now he is diversifying beyond business. The Right Cause party he has offered to lead strongly supports President Dmitry Medvedev, at a time when there’s mounting speculation that Vladimir Putin wants a return to the presidency. It was founded just two years ago as a pro-business party promoting free-market reforms, the rule of law and an end to what it calls the “arbitrary rule of corrupt officialdom”. Mr Prokhorov’s declared aims would be to lead Right Cause to second place in parliamentary elections coming up in December, behind the United Russia party, whose chairman is Vladimir Putin. United Russia is expected to win the parliamentary elections comfortably, but they are widely seen as a dress rehearsal for the presidential election in March. Both Prime Minister Putin and President Medvedev are potential contenders for the presidency next time around. If Mr Prokhorov succeeds in taking over as leader of Right Cause, it will be the first time a Russian business tycoon has taken a prominent role in politics since the imprisonment in 2003 of Mr Khodorkovsky, then head of the Yukos oil giant. Mr Khodorkovsky’s supporters have always insisted this was punishment for daring to oppose Mr Putin. Based on his statement today, Mikhail Prokhorov appears to be taking care to avoid posturing as a defiant opponent of the Kremlin. Right Cause has so far struggled to attract heavyweight leaders in its ranks. Liberals have kept their distance from it, seeing it as too close to the government. Mr Prokhorov’s business empire is based on the Onexim Group, which has wide variety of interests, with gold and nickel at their core. In January 2007, he was arrested on suspicion of arranging prostitutes for guests at a party he hosted in the French Alpine resort of Courchevel. Will Dmitry Medvedev run for 2012? Even as Russian President Dmitry Medvedev declared Tuesday that he will soon decide whether to run for a second term in 2012, the resignation of a powerful deputy prime minister from the board of state oil company OAO Rosneft the day before may provide a clue as to whether Mr. Medvedev has any future in politics. Mr. Medvedev told Chinese media Tuesday ahead of a BRIC summit that he’ll soon decide whether to run in 2012. Less than two weeks ago, Mr. Medvedev, perceived by many as the weaker partner of Prime Minister Vladimir Putin, told key members of Mr. Putin’s government that they would have to leave the boards of the state companies they oversee. He also issued several other orders meant to improve Russia’s bad investment climate. “It’s extremely important for Medvedev that these objectives are fulfilled. These are things that actually matter,” says Sergei Guriev, rector at Moscow’s New Economic School and a member of the Russian president’s commission on national projects. Then late Monday, Rosneft said Deputy Prime Minister Igor Sechin, who oversees the country’s oil and gas industry, would leave its board. As Mr. Medvedev searched for ways to reduce the state’s overbearing role in large, non-transparent companies and in the overall economy, the spotlight must have quickly focused on Mr. Sechin, the oil czar. Long perceived as one of the country’s most powerful men, the staunch Putin ally wasn’t shy about using his post in the government to get things done at Rosneft. Kremlin watchers said any disobedience or foot-dragging from Mr. Sechin would have been a huge loss of face for the president and cast serious doubt on his political future. Thus Mr. Medvedev appears to have received a fresh infusion of political clout. Still, he may have moved against the ministers only with the blessing of Mr. Putin. Also, it’s unclear who will replace Mr. Sechin — perhaps another ally of Mr. Putin or a so-called “independent” director. Although it’s not clear how far the president can go in implementing his plans, the prospect of a reform-minded president backed by Mr. Putin’s political influence would no doubt please investors.